Starting A New IT Job? Here are 3 Quick tips from us to help you Shine. What comes after the interview jitters? Yeah, you guessed it right! “First day on the Job” jitters! If you too suffer from this harrowing phenomenon, you need not worry. 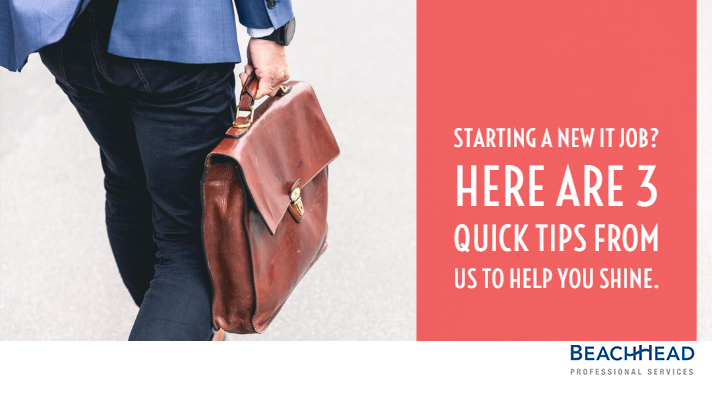 Follow 3 quick tips from us and sail through the first days at your new IT job like a pro. Starting a new role always leaves you with a mixed feeling of excitement, fear, and anxiety. Such feelings and jitters are not uncommon throughout a professional’s life. Though they improve and reduce with more experience you have and more roles you change, they do linger in the back of your mind, thus making you anxious right on the very first day of your new job. If you’re a contractor in the IT domain, you’ve probably switched more than a few jobs and worked with people of varied cultures and habits. In case you still feel jitters on the very first day of your new role – Read On. When starting a new role, or a new project with the organization it is highly important to focus on the achievement and growth opportunity it will bring to you rather than just focusing on the idea that you’re employed now and your job search has come to a rest. The fact that the company has hired you sets expectations in terms of performance and delivery. Coming right down to it “Perform”. You should always treat the first 90 days of your job as a “Golden Phase”. We call it golden because it gives you an amazing opportunity to create actionable goals, learn from the team and build lasting relationships. First and foremost thing to do is to be friendly. It is natural to feel nervous in a room full of strangers. But take the first step. Start the day by introducing yourself to your colleagues. Try preparing a list of informal questions that will help you connect with the team members on a personal level. This approach also comes in handy when you’re talking to your manager during the initial phase of joining. It will help them open up to you and create the foundation for a lasting relationship. Rapid advancement in technology has forced the companies, especially in the Information Technology and Financial Services sector to work in a very fast paced and real-time environment. We see a trend where managers tend to hire people who show the capabilities of performing right from day 1. Therefore, you should invest in real time learning on the job from your very first day of hire. Although most of the companies do host training sessions for new employees, you should also take up the challenge of understanding your roles and responsibilities in detail. The most important fact to keep in mind while on the job is “Never Assume”. Just because your manager is silent on your performance and has not dished out any negative criticism, it doesn’t mean that all is well. Most companies will have their employee reviews setup bi-annually or quarterly. Trust us, if you wait for that long, you could very well be missing the “Bull’s eye” with an inch. It is necessary to genuinely point your efforts towards improving and developing your skills and we assure you that you’ll reap the rewards. So, instead of waiting for your manager to schedule a review for you, schedule it yourself. Ask your manager about where you are in terms of performance and if there is any room for improvement. By directly asking these questions, you establish that you want to learn and grow in the role. Take this as an opportunity to improve and it will surely help you get 5 stars during that annual review meeting. There you have it! 3 tips from us to help you succeed in your new IT job. Remember nothing beats performance. Start your job by focusing on your KPI’s and work relentlessly towards achieving the same. Be ambitious, communicate and listen to others. Remember “Success is no Accident”. Ready to explore New IT Job Opportunities? Send us your resume at info@beach-head.com and we will help. Remember to like us on Facebook and do follow us on Twitter and LinkedIn. Apply to all our latest job openings here.